Monday: More decorating, managed to get a cancellation for Barbara’s spinning class which is just as well as the woman in front of me was trying to get a cancellation too. Full class with 4 first timers. Good class. Twe2.com settings altered as the volume of texts is flattening the battery on the phone. Tuesday: Gym and a spin. Gave out the site address to one of Barbara’s first class. Beryl asked how many calories I burnt when she saw the HRM. It’s around 600 calories for 1 class and 1100 for 2 classes. You have to go hard to achieve these numbers though. Gym for some weights and ran 1km on the treadmill at 9.9km/hr. Shower and home for lunch. 8PM X Bike class at Guinea Gap. No space on the 7PM class but there are only 6 bikes. Spent the afternoon washing all the kit. HRM chest strap battery has given out. The Toy’s cadence sensor has had a new battery. Not as many position’s as a spinning bike but it exercises a totally different muscle group. Particularly upper body due to the adjustable damped spring loaded handlebars. Wednesday: Ride day. A dry day would be nice. A cool start with it brightening up later meant many would be overdressed. A Discovery windshell over a winter jersey would be enough. The usual Franks Breakfast proving to be too much again on another tough ride. Tried out the Brimstage 7 from the Clegg to see if I was up for it. 24.9 mph with no Time Trial bars or carbon wheels mean it’s going to be tough. Took a picture at the start and then it was time to play catchup again. Just when I though I was getting on the back before Woodbank a CTC group with oncoming traffic meant I couldn’t make the turn in time. Caught them up a the A5117 lights and headed out with them along the cycle path. All went well until the lights at Queensferry, here Carols group had caught us up and then I got asked if I was sure I was in the right group by going out with the big hitters. It was fair comment and I’d opted to go with the big hitters. Soon to be undone. I was soon off the back on the climb to Hawarden , a lorry had split the group on the roundabout and I never made it back on. Things didn’t get much better as I’d only the destination and not the route. Where I took a route to Higher Kinnerton taking the walkway over the dual carriage way the others took the main road to Hope. CTC habits die hard. First serious climb was the Steps: B5102 from Cefn-y-Bedd look at the profile on the link to see how it got it’s name. Halfway up I stop at the turnoff to Brybo to look at the Edge, a lorry driver says my mates are waiting for me at the top but it was not to be. Second serious climb is from Minera to Worlds end, it’s no use saving a gear as it’s that steep your not going to get into it once into the climb. It’s another climb with a couple of turns in it that hide the summit. There is a white house that you can see from the other side of the valley that looks a long way up and is. 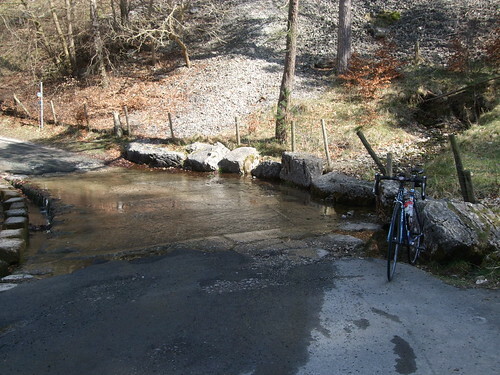 This is the Ford at Worlds End, one way or the other you’ve had a decent ride to get here. 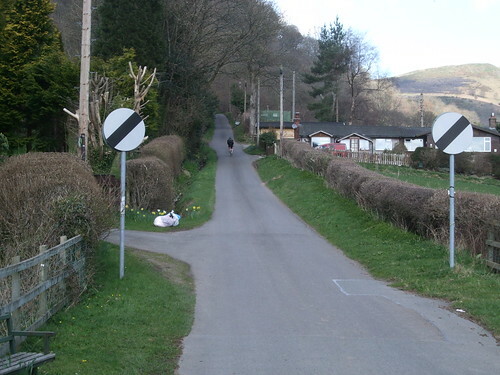 It’s a tough climb from Minera and it’s a tough climb towards Minera. The Fford is treacherous for a cycle, I always take the stones. This is the bottom of the Old Horseshoe Pass which is a hard climb it’s about twice as steep as the Horseshoe pass and peaks at 21% but a lot of it it is 16-18%. Engage your lowest gear or you’ll blow up by the cattle grid. Thursday:Morning spinning class at West Kirby no calories counting as I wasn’t wearing the HRM. I hadn’t had breakfast and forgot the water bottle. Ended up getting a Lucozade sport drink from the vending machine which was just as well as the bike didn’t have a bottle cage. Tough class because of heat lack of fluid and still suffering from yesterdays ride. Gym afterwards for some weights and 2km on the rowing machine. Picked up the comic on the way home but refused to pay £3.99 for 225g of blueberries. I go through a lot of soft fruit and it all adds up. The Toy got a dose of looking at and was found a lot wanting. Front wheel wanted truing so it went to Colin at Wheelbase. The rear wheel had the cassette removed the wheel not spinning too freely but couldn’t be sorted. The lockring on the cassette came off on yesterdays ride an I was doing 30 mph at the time. The chain was too long and has had 2 links taken out, rejoined with a Shimano pin. The 705 is a year old and I’ve broken another bracket. Other than that it’s been OK the altimeter fault sorted itself out. Back on the bike the Look Keo classic pedals are worn out the outer bush has worn a ridge in the axle. Time to upgrade to something better bearing in mind I’ve spent more on cleats. Probably going to go for Ceramic bearings for the rear wheel. Friday: Last day off, read the comic from front to back, going to pick the wheel up and go out for a short ride. Entry for Sunday in the post, it’s full with 150 riders with me in the final group. It’s going to be fun getting to Overton which is going to be very busy. No entries on the line. Picked the wheel up from Colin went shopping and turned up for Margarets Spinning class. During the day I’d swapped batteries as the cell voltage was low. Margaret’s also counting calories tonight. The HRM has been erratic lately and it’s the failing battery on the cheststrap. Tough class and after another good stretching session the number was 725 calories. Transporter 3 to watch on DVD. Sunday: May format this at a later date. Turn up at the parking for the event to see a grass track event underway. 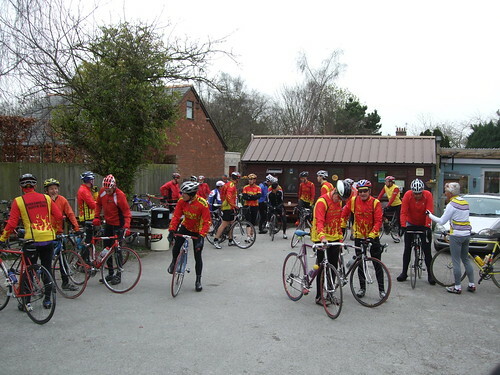 In the Event the event was over subscribed with over double last years entries. 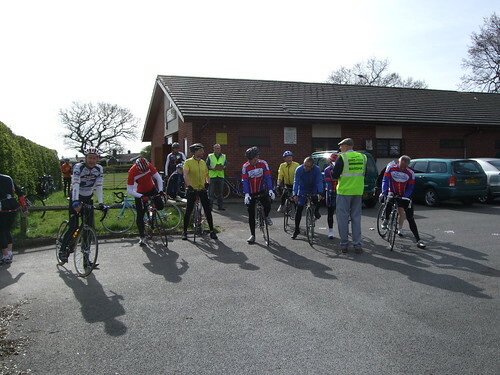 There was an excellent spread at Overton (as usuall), the halfway distance. With 150 riders on the roads in blocks of 10, with the slower riders going off first you would think there you’d be problems. Due to the large entry the opposite was true. I’d chatted with others at the start waiting for the sign on time with groups often going off at ten minute intervals. Someone had a tyre go down rapidly on the line probably due to the tube being pinched. Just before we set off a guy in Astana Kit goes past on a Trek Madone this was a cue to set off in pursuit. It’s a 2 mile drag up to the junction and I didn’t make any headway with him turning off somewhere before the Straight Mile Road. I felt a lot better going up Marford hill this time expecting the control to be at Borras Head. Due the numbers and congestion it been moved to a layby further down the road. The good news was parts of another group were in sight. I’d caught them up by Holt and the lights on the bridge had stopped the others. 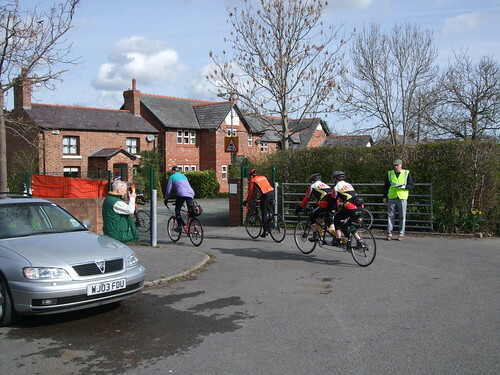 A green light was another cue to hare across the bridge to get a bit of momentum for the climb through Farndon. Holt and Farndon are a common section of the ride on the outward ride and the return. If you let a satnav route you, you’d bypass all this and let it take you down the A534. From now on it is a flat big ring ride, which it has been since Borras Head. Pass another puncture just after Crewe by Farndon, it can happen to anyone. So it looks like you had a sub 3 hour run, well done. It was a good day for it. We had a good run too on the tandem. We even managed to put a detour in on the way home to get 102 miles. I have used bike route toaster and will be giving the course a try this week end. Thanks for the info. I was the guy you chatted with in the village hall after the ride. I had to plot the ride as 2 separate rides out to Overton and back as I hit the 100 limit when using autorouting for the whole course. I notice that your route didn’t seem to use the automatic course point warning before each turn on the route. This is what put me over the 100 limit. Am I correct – or have I missed something? I wouldn’t like to use a course without the warnings (I set it to 350 feet before the actual turn). Hi Chris, I know what you mean about not having a warning before the turn. BikeRouteToaster sticks the CoursePoint bang on the junction. A lot of the time it was calling the turn after the event. Another thing I noted was you don’t get the countdown and distance to the turn when using a Course. I had the Course screen up a fair bit of the time so had a distance and time to the next turn. Placing a Coursepoint after a turn gives a confirmation that you are still on course with BRT naming it Straight. This also lets BRT get the right direction CoursePoint for the turn. Have”nt visited you for a long time ! your ride reports and pics as always are great.The rest im afraid not my cup of tea!